Watching the the iOS 12 launch at WWDC 2018, one might have been forgiven for thinking that the new software was a little shorn of features. 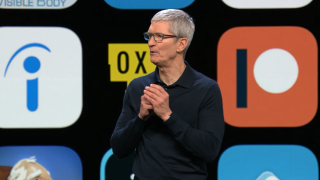 Despite whipping through the keynote at breakneck speed, there didn’t seem a lot of time dedicated to the new software that’s going to be landing on millions of devices in the near future. While there were some neat new touches to the software and a raft of improvements - which you can read about in our natty iOS 12 explainer - we’ve had a dig through the preview and found that there are loads of other enhancements to the software that will likely have a big impact on your experience. Like Craig Federighi breathlessly crooning over the latest software launch, we’ll try and get through them as quickly as possible - but there are some hidden gems here that you’ll want to know about. FaceTime got a big update with the addition of group video chatting at WWDC, but even the Watch and HomePod got in on the action. Obviously they’re only audio-ready (given they don’t have cameras) but you can join a FaceTime conference call from your kitchen or while out kayaking without needing to carry a phone. This is something that anyone with an iPad and iPhone X will love: you can now swipe up from the bottom of the screen to get home, much like on an iPhone X (although we’re not sure whether you’ll be able to jump between apps in the same way). You’ll also be able to access the Control Center by pulling down from the same top right-hand corner, which makes much more sense. If you’ve used the Portrait Lighting on one of the newer iPhones with dual cameras, you’ll know that the edges can be a little bit raggedy at times, especially in the black and white mode. The new mode generates a mask of the person and separates them more effectively from the scene, meaning a more natural-looking image of your lovely face. This is something we get a lot of questions on - hence our explainer on how to use a QR code on an iPad or iPhone. That’s going to be a lot easier as the camera will automatically pick up a QR code in the scene, making it a lot simpler to scan. Apple’s not gone into too much depth with this one, but it seems that the brand is going to take on the likes of 1Password and LastPass by automatically creating and storing ‘strong’ passwords within Safari and iOS. We’re not sure how this one is going to work without the iPhone explicitly knowing your passwords, but if you’re using the same one across multiple platforms then the list will flag it for you, and you can alter it to something strong and saved by the iPhone itself. A lot was made in the iOS 12 keynote about how you’re going to be encouraged to use your phone less, but that doesn’t mean during the quiet, undisturbed times you’ll miss critical things. Certain apps will be able to break through the Do Not Disturb barrier, meaning healthcare or loved ones will be able to get hold of you at the right time. Yeah, maybe this isn’t going to change your life, but the strip of apps you can use when typing in iMessages (a useful feature, and we encourage you to try the basketball game with friends) is going to get in the way a little less by being thinner. Instant Tuning is the ability to tailor your notifications on your phone, and Apple made a big deal about it onstage. However, you’ll be able to make it so some apps’ updates will still show in the Notifications Center, but will migrate there silently. Apple made a point of telling us about the new USDZ file format it’ll be using to create AR experiences, and while most consumers will find that dull the new software will allow you to share these AR experiences across Files, Mail, Messages, and Safari, and that’s something people can get on board with. Searching through your photos is about to get easier, with more options to find the snap you want. While we don’t know how it can identify them, Apple has said iOS 12 will let you search for a pic using an event as an umbrella term. You can import and manage photos in RAW format on your iPad and iPhone now, and if you’ve got a powerful iPad Pro you’ll be able to edit them too, thanks to upgrades in the new software. Been getting a little over-excited about how long you can make Animoji messages for? Consumers have clearly felt like things were too short, as now you can annoy your pals as a panda for 30 seconds at a go. Now you can cross-reference what’s happening in your Photo gallery and find the right snap more easily, by being able to add in two words like ‘cat’ and ‘palm tree’ to locate the specific image. As part of better Portrait mode in the camera, third party apps will be able to use the software to separate the foreground and background of a snap to play with new cool effects. ‘Hey Siri, who’s winning the Formula One world championship right now?’ ‘I’m sorry, I don’t have that info, here’s a web search…’ will be something you won’t hear any more, as Siri can now chat about loud engines with you directly. Yes, motorsport updates are included. Didn’t know you can translate with Siri? Well, not only could you already do that, but Siri now supports 40 more language pairs to help you ask stupid questions in another language. Don’t care about celebrity gossip? Move on. Want to know what the latest book from Dan Brown was? Ask away… but Siri may answer sarcastically if Apple’s improved the AI module at all. Siri knows more about food now, including the intriguing phrase ‘How healthy is fish?’. The information is pulled from the USDA (US Department of Agriculture) website and can give info on ingredients, food content and calories when you blab about breaking a diet to Siri. Siri might know a little too much about you soon, but while that happens he or she can remember your passwords - and you’ll just have to ask like a forgetful grandpa to have the information given to you. This is something that Android users have enjoyed for a while - but if you’re using two-factor authentication (and you should) and have to get a text to log in, iOS 12 can now read the message you get with a code and autofill it for you. Handy. This already sort of happens, but you can throw passwords from an iPhone or iPad to a Mac or Apple TV without having to scrabble around and look at small bits of paper to remember your ‘P@$$word’ way of getting into things. Wondering why your phone is running so low on battery all the time? Well, with iOS 12 you’ll get info on your usage for the last 24 hours, or 10 days, with the same tap opening up information from each app that’s sucking your power down to help you make better decisions. Not only do you get new related English words with the thesaurus, we’re also going to see an Arabic and English bilingual dictionary, a Hindi and English bilingual dictionary, and a Hebrew dictionary to help you learn words in more languages.